ANGEL - Oranjestad- Great News! We finally managed to get to the laundromat today. There were four loads to be washed and, in this hot climate, you can imagine how pressing was the need to get it done! I did get some very strange looks from passers-by when I stood outside with my handheld radio to call my chauffeur. How quickly people forget that not so long ago mobile phones were as big as that! Joan and Al from BREAK & RUN gave me a lift over to the reef outside Renaissance Island where we had a vigourous swim and snorkelled over the sunken barge. While Joan and I were arranging this outing over the radio, Judy, a single-hander on QUEST, asked if we were heading to Carthagena as she wanted a buddy boat to travel with. Seeing that both ANGEL and QUEST are disabled at the moment, the answer is "Heaven only knows"! It rained during the night and we managed to jump out of bed and close all the hatches and portholes in record time (practice makes perfect). All but two, that is! As a result, the morning sun looked down at a quilt hanging over the boom and settee and cockpit cushions strewn about the foredeck. While I was swimming, Francis made a visit to ANGEL. GREAT NEWS! He found the source of our smoldering plastic. As Dave suspected, it WAS ignition-related. However, the fault was not in the engine room, but in the cockpit control panel. Apparently it was a long-standing problem. The wires were loosening and the seal was not intact, so moisture was also building up and doing damage.. (We lost the "engine hours" readings years ago.) The unit could have broken down or gone up in flames at any time. THE POWER SWITCH FIASCO HAD NOTHING TO DO WITH THE PROBLEM!!! Sanders at the Marina has ordered a new control panel and it should be here by the end of next week. What a relief! JO MAMA, KARA DREAM and ANGEL this evening (actually, before 5:30 to catch the Early Bird Special) at El Gaucho. What a great meal- especially the dessert crepes with dulce de leche sauce. Our waiter was a riot. By the time we left the restaurant was completely packed- including a wedding party (two busloads of people) upstairs. A great finish to a milestone day. One of our neighbours in Oranjestad. 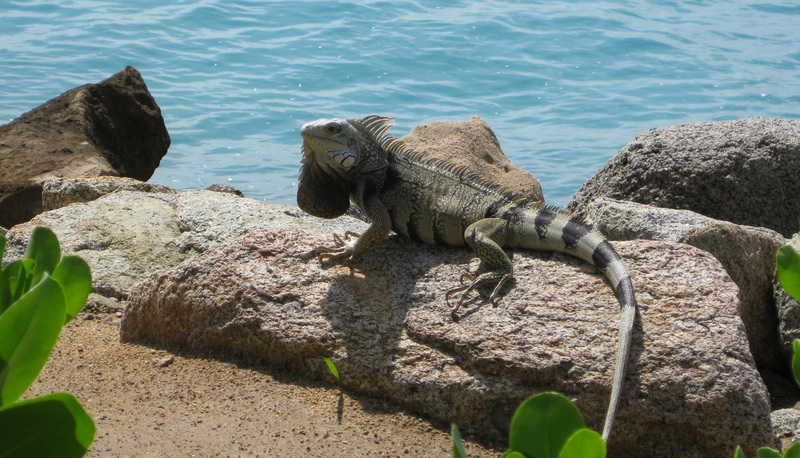 Iguanas are found everywhere!